blacksheep wrote: I think the real cause is Mesa's absence. Any chance we can get him back? USD holds on to beat BYU. USD now also has 3 wins... and a nice tiebreaker, assuming BYU finishes in the top 3. Pepperdine and USD now have wins against top-3 teams (both against BYU). Now it's our turn tonight against the Gaels. Go Pilots!!! I'm rooting for Santa Clara to beat Pepperdine tonight, in Santa Clara. That would create a three-way tie for third place. NoPoNeighbor wrote: Pepperdine and USD now have wins against top-3 teams (both against BYU). Now it's our turn tonight against the Gaels. Go Pilots!!!
. BYU isn't in the top three. Their best hope is to be In a three way tie for third if SCU wins tonight. But right now they are in fourth. 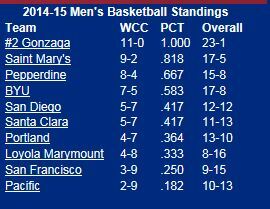 I was thinking more the "Big 3" programs of the WCC (GU, BYU, SMC), rather than the top-3 in the standings at the moment. Should have been more clear. SCU up 3 on PEP with 4.5 seconds to go. Foul or no foul?? edit: No foul, and no one hit a ridiculous off-balance 3 at the end. SCU wins. LMU wins at USF tonight 70-69. SCU holds on against PU 60-57. 3 way tie for 3rd at 5-4 with BYU, PU and SCU. 3 way tie for 6th at 3-6 among UP, USF and USD. 2 way tie for 9th at 2-7 for UOP and LMU. Looking ahead to next Thursday, in addition to the expected thrashing in Spokane (being realistic, c'mon), SCU goes to USD, USF goes to BYU, PU goes to UOP, and LMU goes to SMC. Pilots could lose and easily still be tied for 6th. Next Saturday is separation day. While Pilots rest, LMU is at UOP (both currently 2-7), USF is as USD (both currently 3-6), and SCU is at BYU (both currently 5-4). PU is at SMC, and GU plays Memphis in their bracket enhancement game; Memphis however isn't holding up their end of that deal at 12-7. I wanted to compare last year's results with this year's for conference games. Not in terms of the games chronologically, but in terms of the 18 distinct games that are played (opponent and location). Through the first 9 games, we are 3-6. As you'll see below, that was our same record in those 9 games last year. This year we've won two games that we lost last year (at home against SCU, and on the road at USD). However, we've also lost two games that we won last year (at home to GU, on the road at LMU). In the remaining 9 games, our record last year was 4-5. In WCC games today, USD beat USF 77-69. They're on a 3 game win streak, all at home. BYU beat SCU by 21 in Provo. LMU won at Pacific, in OT, 76-71. Pepp beat SMC in Moraga 67-62! I hadn't paid attention the Thursday's results, but there were no upsets other than USD > SCU. Can GU win-out and get a #1 seed in March? HUGE game on Saturday. Time to make a move! That means a winning streak. We won at SCU last year. If we are going to improve on last season's conference showing we need to win there again. Go Pilots! SCU led much of the game into the second half tonight against GU before GU's star power took over. LMU was pretty dominate over USD. And it was great to see PU overcome something like a 22ok, 16 point deficit to defeat BYU. Nice win by LMU. And BYU fans have to be going nuts after blowing a 16 point lead; I'm afraid to look at their board. I'm happy for Pepperdine. But their PA announcer is OBNOXIOUS! I watched the game on TheW.tv, and he is like a professional wrestling announcer, and he never shuts up. Might be enough to drive away many casual fans. NoPoNeighbor wrote: I'm happy for Pepperdine. But their PA announcer is OBNOXIOUS! I watched the game on TheW.tv, and he is like a professional wrestling announcer, and he never shuts up. The best PA announcer I've heard this year does the UP women's games. Ironically, he's the guy that does the UP men's home games on streaming video......the guy NPN loves to hate. Seriously, he is much, much better than the PA announcer at the UP men's games....and there's none of this "From the River Campus" crap on made 3-pointers we've been hearing. Amazing how much better that looks after just one night of play...a win over Santa Clara tomorrow certainly puts UP in the driver's seat for fifth. Won't be easy though. SCU will be desperate...they're already on a three-game losing streak, and after Saturday they've only got two home games left....and one of those will be a difficult one against SMC. Im glad someone else is annoyed by the commentary on made 3-pointers. It is really dumb and "forced". If you want to pull something like that every once in a while, fine... but not when the player's toe is almost on the line. Save it for a "big" 3 that is actually well behind the line, and let it come out naturally! Just when you think you might have the WCC figured out...USD goes and lays the smack down on Pepperdine on the road. USD appears to be playing well of late... that could be a huge game in Chiles on the closing weekend. We have the chance to gain the first tiebreaker on them, as well! With the season sweep of SCU, we own the tiebreaker for tourney seedings against them. This is a good thing. Terry Cahill wrote: Just when you think you might have the WCC figured out...USD goes and lays the smack down on Pepperdine on the road. Yup, and that PU hairball lets BYU back in the picture for 3rd place. 3rd/4th is also very important positioning to avoid GU in the semis in Vegas. USD's last two road games were losses to UOP and LMU. Then they beat PU. 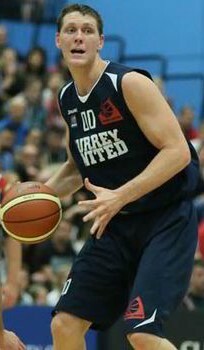 up7587 wrote: 3rd/4th is also very important positioning to avoid GU in the semis in Vegas. So along that vein....would you rather be 5th or 6th?